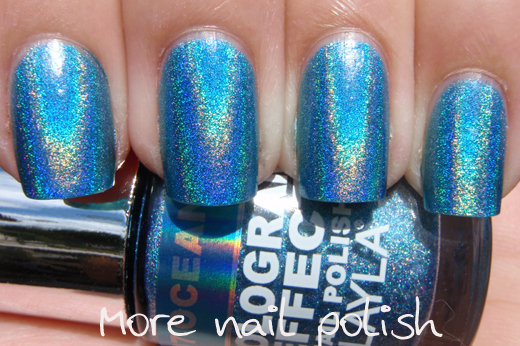 Here is part 2 of the Layla Hologram Effect polishes. Pictures first, chat chat after. Please note that I fought with the sun all day taking these photos, running outside anytime the clouds parted long enough to take some sun shots. So most of these are actually way more holo than these photos show, because the sun was partly covered with washed out clouds for many of these photos. 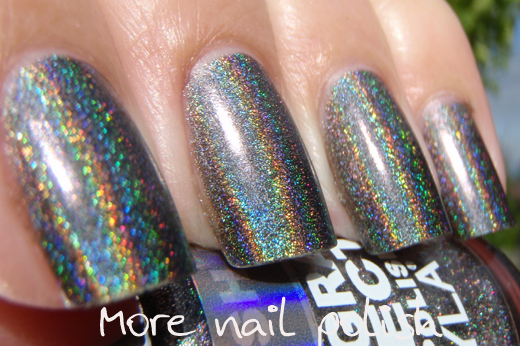 Flash Black - charcoal grey seriously linear holo. 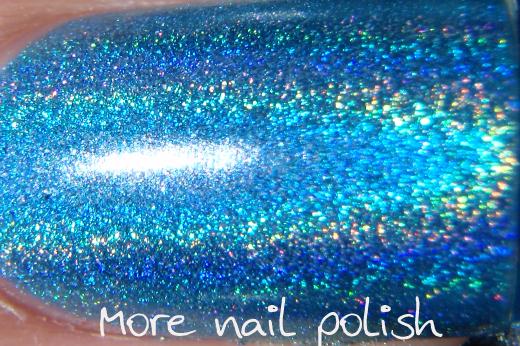 Ocean Rush - mid toned blue holo. 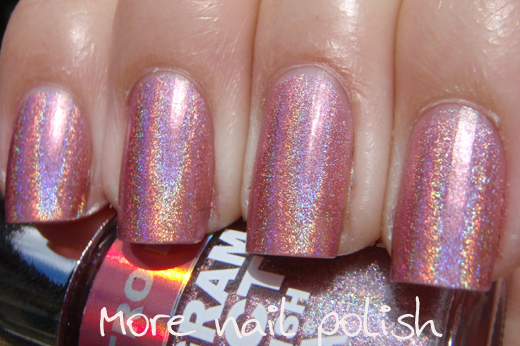 Retro Pink - light pink holo. Ultra Violet - Lavender holo. Ok ok, so now lets get into the nitty gritty stuff. Formula. To start with, I gave these bottles a good shake cause I felt like the holo powder needed a good mix. The balls in these polishes really rattle and the polish sounds very thin. Looking at the polish, it does seem thin, but it's not runny. You can easily layer a thick coat on and it will dry really fast. 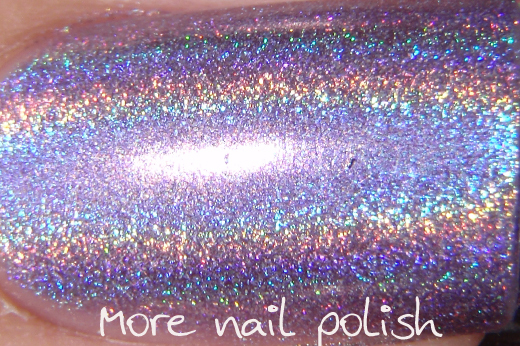 Application.When I applied the polish the holo particles seems to be floating and dancing all over the place in the wet polish, it was strange to watch. It wasn't streaky but it was definitely weird application for the first coat. My recommendation is, ignore what it looks like as it's going on, and just paint your nails as usual. The second coat went on perfectly. 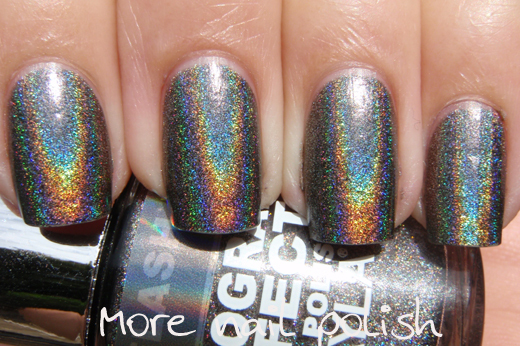 I was expecting the same balding issues that you get the Nfu Oh and Gosh Holos, but no, this was just perfect on the second coat. All my swatches show two coats, with no base coat or no top coat. So sorry, I can't tell you if top coat dulls these. Wear. I've been wearing Flash Black for a full 24 hours now, with no base or top coat and I am totally amazed that I don't have chips everywhere. 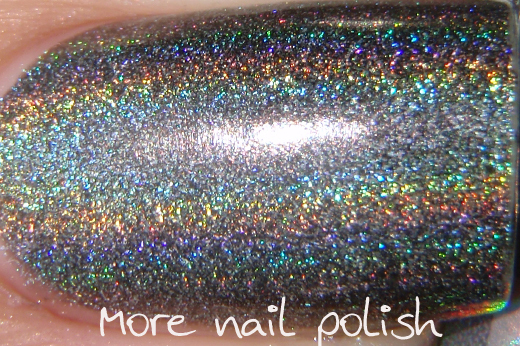 Nfu Oh and Gosh holo are terrible for wear unless you do a holo sandwich (ie two coats of holo, then top coat, then holo coat, then top coat). This polish has lasted very well. I do have some tip wear on the outer edges of the nail, but nothing noticeable, especially as Flash Black is a darkish polish. Where to buy. I purchased these directly from Layla Cosmetics in Milan Italy after an email recommendation from Tuli from Prettify our nails - Thanks Tuli!! They cost €11.90 each and the site says that international shipping is €30 (or €15 for orders over €80). 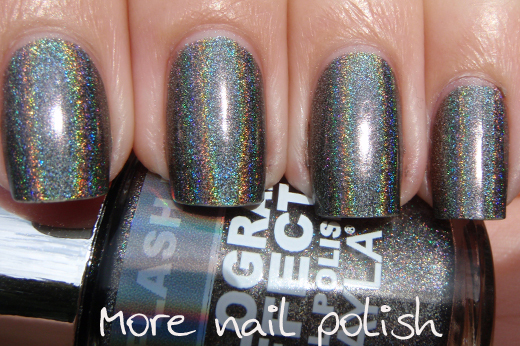 I also purchased some Layla Magnetic polishes at the same time, so my order was over €150. But at checkout it said free shipping. SWEET! I'm not sure at what value the free international shipping kicks in, but it's worth thinking about if ladies want to do a group order. And what I discovered is that is wasn't just free regular post, it was DHL tracked. I ordered my polishes on Wednesday night, received tracking information on Thursday and got the polishes delivered on Tuesday. Less than a week! I'm super impressed by that service!! Overall impression. 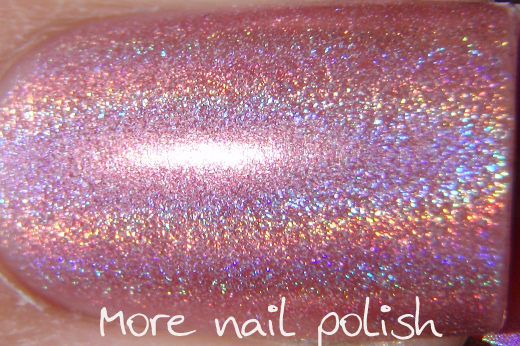 The colours, the holo and the wear on these totally make them worth the €12 (converted to $14.80 AUD) I popped on each bottle. Yeah, I know that seems expensive, but when in Target today and I was looking at Revlon polishes for $15.95, I feel like these are a total bargain for what you are getting. I'm tempted to get backups. So there you go, let me know if you have any questions. 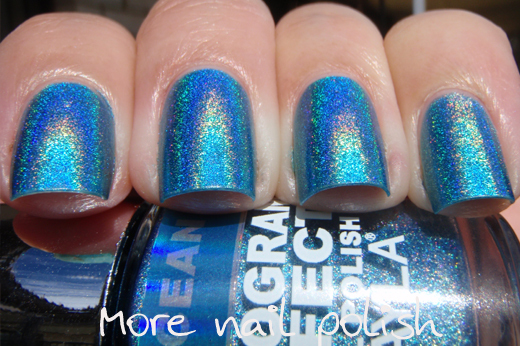 I'll get onto the comparisons for Mercury Twilight and Flash Black today, it looks sunny! I've just finished comparison swatching. I did all of them with what I had that was similar. Will get them all posed tonight. Thanks - blew my budget big time, but totally worth it. Really Price Attack. I've never seen them in store here. I will have a look out for them. They are all so beautiful! Nice pics! 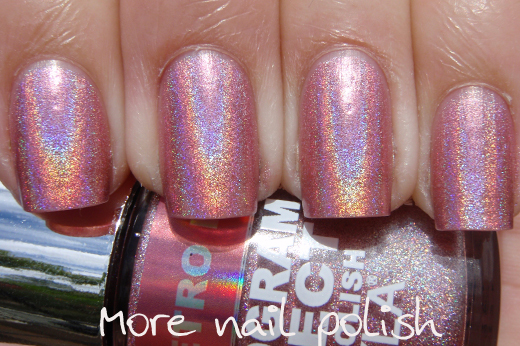 I believe you just knocked me out with that holo gorgeousness! And they really are stronger in full sun. The blue is my favourite!! The blue one looks amazing on. So rich in colour and yet so much rainbow. they're incredible! How many mls in each bottle? the standard 15mls? Thanks! Nope, only little 10mls! SAD! They are so fantastic... If you do decide to get backups, I'll get a few and go in for a group buy. I'm in Brisbane so postage won't be too much from you to me.. Twitter DM me if you do.. xoxolaurenmm. Thanks for the swatches!! Hi Lauren I live in Ipswich and keen to get some, are there any watches of the other colours?? I almost chocked on my tea when I read that Revlon polishes are over 15AUD. That makes them over $16US. My god, I know that shipping is expensive, but seriously?! I will no longer complain about having to pay $8 bucks for a drug store nail polish. 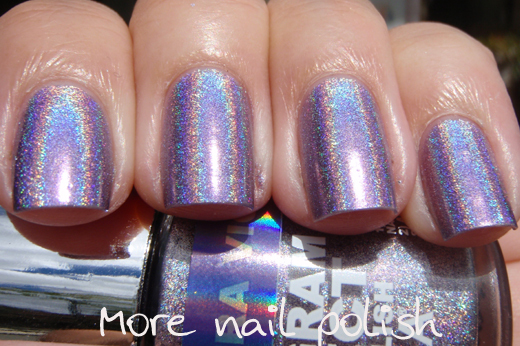 Also, I am in love with Ultra Violet. 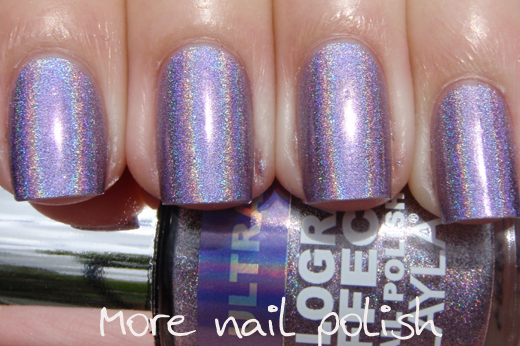 Been looking for a good purple holo for a while now. It is just so shiny! Yep I know. And if you want to buy OPI in store it's $20. 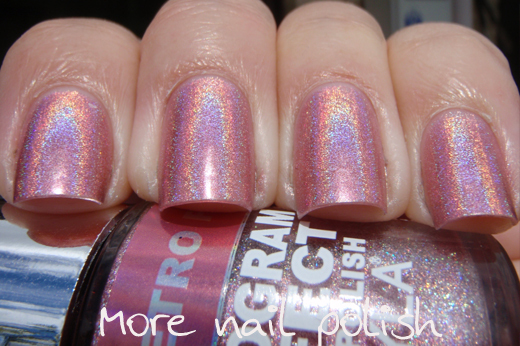 I guess that's why we don't find Ozotic polishes expensive and we pretty much buy all our polish overseas. 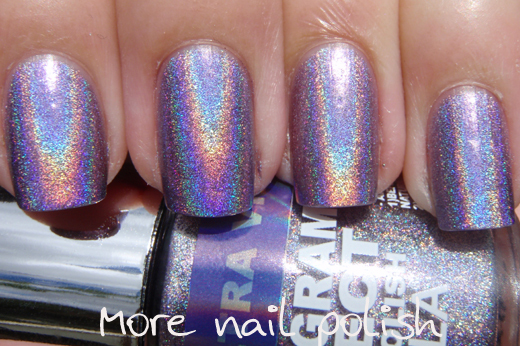 Ultra Violet is beautiful. 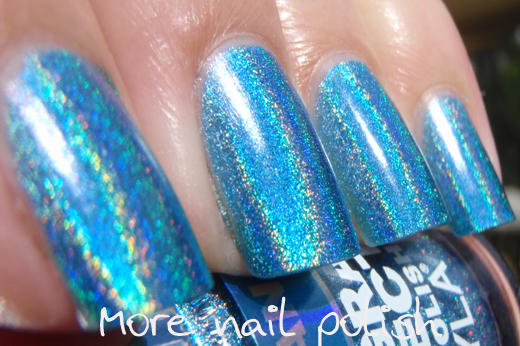 A unique shade in my holo collection. Yep Aus is a total rip off $20++ for both OPI and china glaze. I got a mini orly lollipop today that cost me $8 rip off!!! Has anyone seen Layla in stores here? These look freaking awesome! 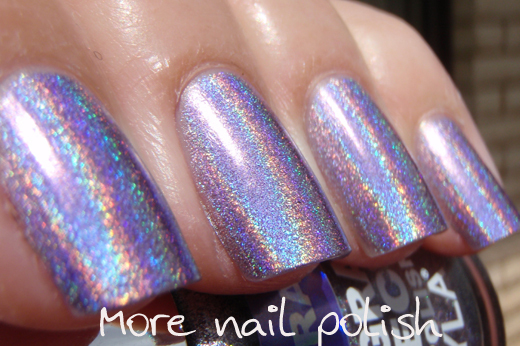 Holo madness! Really excited to see your comparisons! Thanks for taking the time and effort (and not to mention money) to swatch these pretties! Thank you. More than happy to spend the money on these beauties. Will do comparison swatches of Mercury Twilight and Flash Black today, will have to see how others compare. Awesome swatches, thank you so much! I'm stuck on your comment of $16 per bottle of Revlon! WOW! 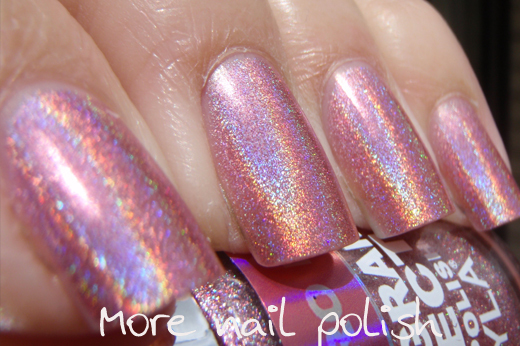 And those look pretty holo to me! I love your pictures! They are beautiful! I know, $15 Australian is the standard price around here from Revlon in a drug store. I don't know why we pay so much more, especially when our dollar is so strong now. i'm more than happy to go in a group share if one can be arranged. Thanks. I post about a group order in my next post. Sorry for your wallet, but they are totally worth it in my opinion. 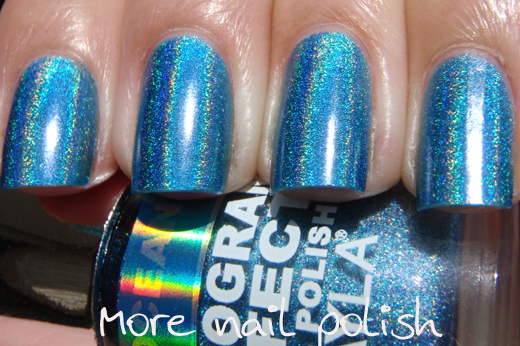 Beautiful, my nail junky friend and I did a combined order and got free international DHL shipping. We ordered 82 euro. 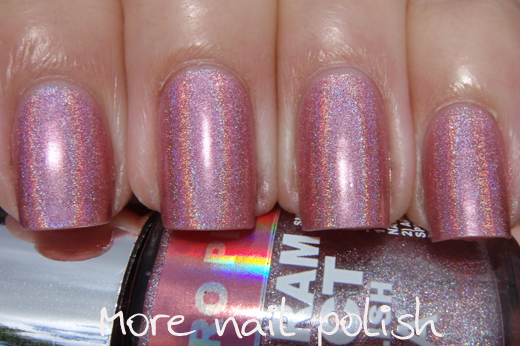 I think the free shipping was a glitch cause now it's 15 euro if you buy atleast 80 euro worth of polish. I really want to order extras!!!! Thanks for the swatches. I am trying to place my order, but it keeps asking me for a tax Id. I am in the United States and I don't have one!! Any suggestions to get around this? I believe they have done something to their site, I've had a few emails about this. I never had to enter a tax id. I suggest you try emailing them. I used a normal transparent polish (NYC cheap brand) over Flash Black and the holo stayed the same. I've heard it loses the effect only with fast drying top coats. Thanks Simona - note to self, don't use fast dry top coat! Ups... only today I saw the second part of the post! I'm happy to know that you liked the collection, they are really amazing! I am trying to order from the layla cosmetics website. I am in the United States but it is asking me for a tax id, is there a way to get around this? 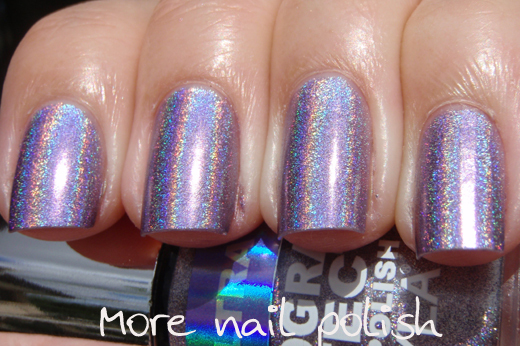 how do u like these compared to China Glaze DV8? Will u consider this a dupe?